The Honda HHH25D hedge trimmer is powered by the super quiet GX25 four stroke engine providing plenty of power, making it the perfect tool for keeping your garden (or your clients) really clean. The exclusive 4-way anti-vibration handle reduces the vibration of the trimmer while the ergonomically 3-way rotational rear handle ensures precise trimming and comfortable positioning for the operator. As usual the Honda engine means no need to mix your petrol with oil as all Honda engines take straight unleaded fuel which is hassle free! The HHH25D weighs only 6.6kg making it a pleasure to use for the operator with its accurate trimming and anti vibration technology. 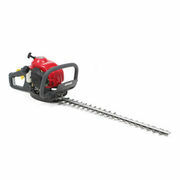 The cutting blade on the Honda HHH25D hedge trimmer is a huge 720mm long. 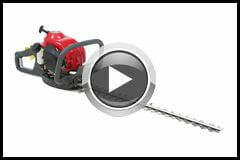 Meaning you can easily take on the bigger jobs with you easy start Honda HHH25D hedge trimmer. 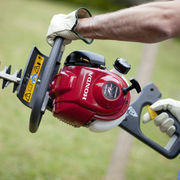 The double sided blade guard ensures safety is a important aspect with Honda's HHH25D hedge trimmer. Further complimented by its two-motion throttle trigger, meaning the blades wait until the operator is ready. 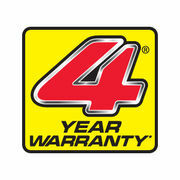 Once again the Honda HHH25D comes with a 4 domestic warranty and 1 year commercial warranty. As Honda backs their products in for the long haul and so should you! Honda's 4-stroke engines ensure that you will never have to worry about the hassle of mixing petrol with oil. As Honda engines only take straight unleaded petrol. Super quiet and powerful engine. Giving you all the power you will need to get the job done. The anti-vibration handle ensures the operator gets less fatigued during the use of the HHH25D meaning they can work for longer and get jobs done quicker. 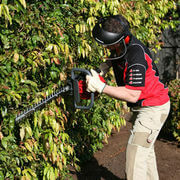 The adjustable handle means that the HH25D hedge trimmer can go places other hedge trimmers cannot. You can also adjust the handle position for your comfort needs.